I did it! I did it! As my two year old daughter would say....we finally painted our front door. Now I know you guys suggested that I paint my front door red in this post, but I had to let my husband have his way and we went with Snapdragon Yellow No. 91232. 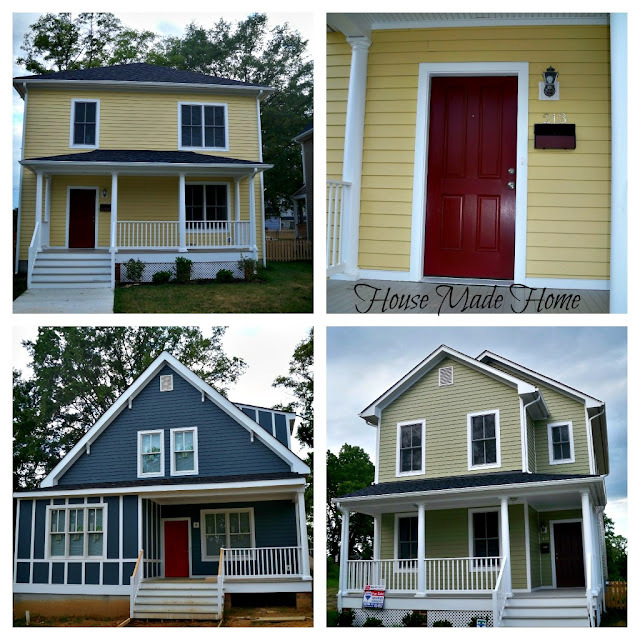 I won't just blame the hubs though, I wanted yellow as well because there are so many other homes in my neighborhood that have different shades of red and I like to be different....and Snapdragon Yellow really stands out! By the way...I'm not just going out taking random pictures of my neighbors homes. These are actually not my "neighbors", they're my neighboring homes because at the moment they are still under construction or under contract. I picked up some free [yep....free] plastic at Lowe's after purchasing my paint. I used this to cover the front door from the inside to keep the bugs out while painting. We removed all of the hardware [door knob, deadbolt and "peephole"]. Sanded down the entire door using medium grit sandpaper--nope no deglosser necessary! I wish that just one coat would have done the trick....I'm not that lucky!!! We did five--yes FIVE, thin, even coats before we were satisfied. 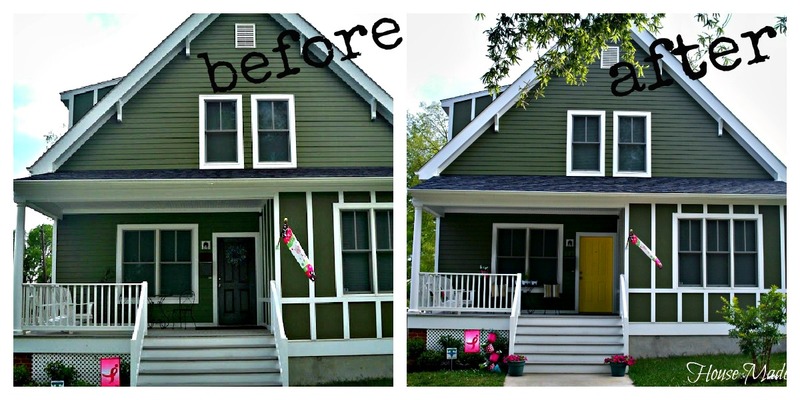 I always like to see a front door with a fresh coat of paint. It makes a home feel really welcoming. So whatcha think about the Snapdragon yellow? Thanks Elise! It was work putting on 5 coats, but it was the waiting between coats that was a pain! Nice, it really pops, and it's very summery! Great job. LOVE the color!! 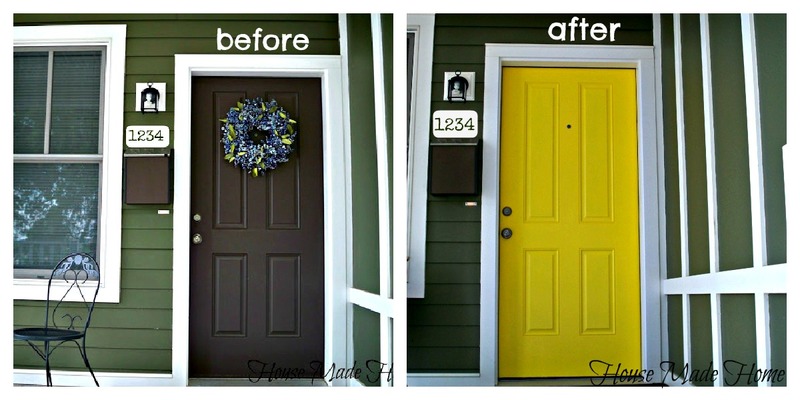 I have been thinking about changing my door from yucky brown to navy blue! Now I think I will actually do it! LOL Thank you! Hey, I wanted to pass along the Sunshine Award to you for being creative and inspirational. Stop by my blog when you get a chance to pick it up! Oh I love it!!! The color is absolutely gorgeous!!! Thanks so much for sharing at Thursday's Temptation. 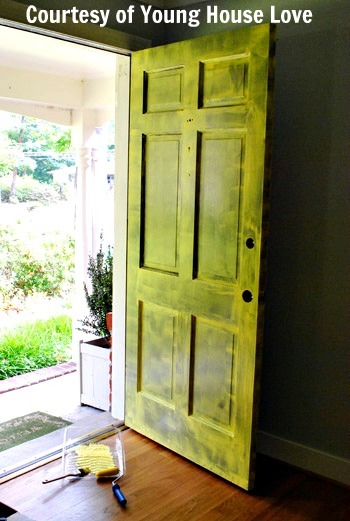 We just painted our back door yellow (Deep Cowslip 6)and I LOVE it. Great choice. LOVE THE YELLOW!!! Your hubby and you did good choosing yellow! Thanks for sharing at The DIY Dreamer... From Dream To Reality! I love the yellow! It makes the entry so sunny and inviting. Thanks so much for sharing on Tout It Tuesday! Hope to see you next week. The new door color fits well with the entire house color.It gives a new meaning in the house.I never taught that a yellow door fits well with green.